Bernard Poirier has a theory that malt whisky can enhance the enjoyment of almost any meal, and he does not mean cooking with malt whisky, although, with a tip of the hat to Dione Pattulo, he certainly delves deep into that area as well, but rather his main focus is selecting just the right whisky to drink with a meal. The basics, he says, are almost intuitive: pungent island malts complement seafood, while full, round-bodied Highlanders go well with heavier meats such as beef. Subtle Lowlanders best accompany milder fare. The book begins with an overview of malt whisky – malt whisky as it was in the 1980’s that is. It’s remarkable what the information age has done for our knowledge of whisky. Only twenty years ago, when Bernard Poirier penned Whisky For Dinner, much whisky knowledge we take for granted now, was a mystery even to connoisseurs like Poirier himself. An even slightly knowledgeable whisky fan today might thus be tempted to scoff at Poirier, for his first few chapters include a number of myths and deductions that have since been discarded. Persevering though is well worth the while of even the most knowledgeable malt-o-phile, for Whisky With Dinner still stands as the best analysis of food and whisky matching, and whisky cookery available. 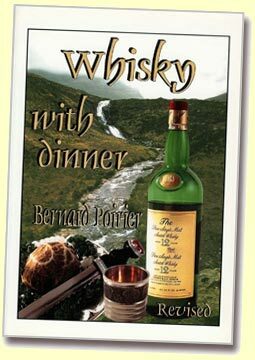 Though now out of print, Whisky With Dinner is easily found on line for those wanting help stretching their palates. The selection of malts available in 1989 was nothing like it is today, and Poirier was safe in describing house styles in his tastings and matchings. His ability to reduce a malt to its key essentials is one of the reasons this book is a good generic guide to whisky cookery and food-whisky matching. Just as some wine writers are now beginning to abandon, esoteric and sometimes lurid tasting notes and return to basic pairings such as red wine with red meat, so Poirier introduces whisky descriptions that are simple and to the point. He uses four basic whisky characteristics, colour, nose, flavour and finish, as the basis for his food matching. Of colour he recommends a three-point scale: light, medium, and heavy, along with the actual colour – yellow, gold, amber and mahogany. He also makes reference to using the “legs” to get an idea of the viscosity of the whisky. Poirier analyses three elements of the nose. The “attack,” measures whether the fumes are sharp or gentle. Other characteristics of the nose are “presence” and “persistence.” When it comes to taste, Poirier describes body, bite, balance and aftertaste. No candied cumquats or amarula peelings for Poirier. Thus he describes Cragganmore as “medium amber with excellent legs; medium sting to the nose with strong and persistent presence; full, well-rounded body and very well balanced with good aftertaste. Glenfarclas 15yo is dark amber with very good legs; sharp to the nose but with a moderate presence, quite persistent; full-bodied and delicate; very well balanced with a lingering aftertaste with a very slight hint of peat. Mortlach – very pale colour, good legs, light nose, medium but lingering presence; round but not full body; delicate and smooth with peaty mustiness. To Poirier Mortlach tastes like a bagpipe bladder – the perfect match for organ meats such as kidney. Instructions for matching whisky with food proceed through the courses with plenty of examples and lots of encouragement for experimentation. The idea always is to enhance the dining experience. Poirier is not above cutting his drams a little either to avoid overpowering a delicate dish and he gives instructions for appropriate dilutions. All this is spiced with Poirier’s dry wit. Of cooking with whisky Poirier includes numerous recipes, though he is clear to state Whisky With Dinner is not a recipe book. Patés, soups including Scotch broth, main dishes of beast, fish and fowl along with sauces, and of course, haggis are included, but one of the more amusing is his own concoction on rum balls, a treat he aptly names Scotch grapes. Unlike Patullo, who favoured cooking with blends, for the sake of economy, Poirier believes that malt whiskies will make the meal just that much better, though he does still favour blends for puddings, sweets, and sauces that already have their own characteristic flavour. Poirier helped found the Scotch malt club, An Quaich, and he briefly talks about how they started and how they ran their whisky dinners, with drams matched to courses. He then makes the modern-day collector weep as he runs through his stock which includes such beauties, then common, as Ben Wyvis 10yo, Ladyburn 12yo, and original Ardbeg 10yo. Ahh, so much has changed in so short a time. Poirier concludes with a table of malt whiskies and the foods they complement. A little dated,yes, but Whisky With Dinner is very much worth the read.